Sizes and shapes of nuclei with more than 100 protons were so far experimentally inaccessible. 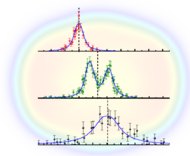 Laser spectroscopy is an established technique in measuring fundamental properties of exotic atoms and their nuclei. For the first time, this technique was now extended to precisely measure the optical excitation of atomic levels in the atomic shell of three isotopes of the heavy element nobelium, which contain 102 protons in their nuclei and do not occur naturally. This was reported by an international team of scientists from GSI Helmholtzzentrum für Schwerionenforschung, Johannes Gutenberg University Mainz (JGU), the Helmholtz Institute Mainz (HIM), TU Darmstadt, KU Leuven in Belgium, the University of Liverpool in the UK und TRIUMF in Vancouver, Canada. Nuclei of heavy elements can be produced at minute quantities of a few atoms per second in fusion reactions using powerful particle accelerators. The obtained results are well described by nuclear models, which suggest the nuclei to have a bubble-like structure with lower density in their center than at their surface. The results were published in a recent article in Physical Review Letters. Atoms consist of a positively charged nucleus surrounded by an electron shell. The inner electrons penetrate the volume of the nucleus and thus atomic level energies are influenced by the size and shape of the atomic nucleus. A difference in size of two different atomic nuclei resulting, for example, from a different number of neutrons results in a small shift of electronic energy levels. Precise measurements of these energies are possible using laser light. Energy shifts are traced by varying the frequency and correspondingly the color of the light required to excite electrons to higher energy levels. So far, this method could only be applied to isotopes of lighter elements which are produced at larger production rates and whose atomic structure was already known from experiments with abundant long-lived or stable isotopes. Nuclei of elements above fermium (Fm, Z=100) can be produced at minute quantities of a few atoms per second in fusion reactions and generally exist only for at most a few seconds. Therefore, their atomic structure was so far not accessible with laser spectroscopic methods. 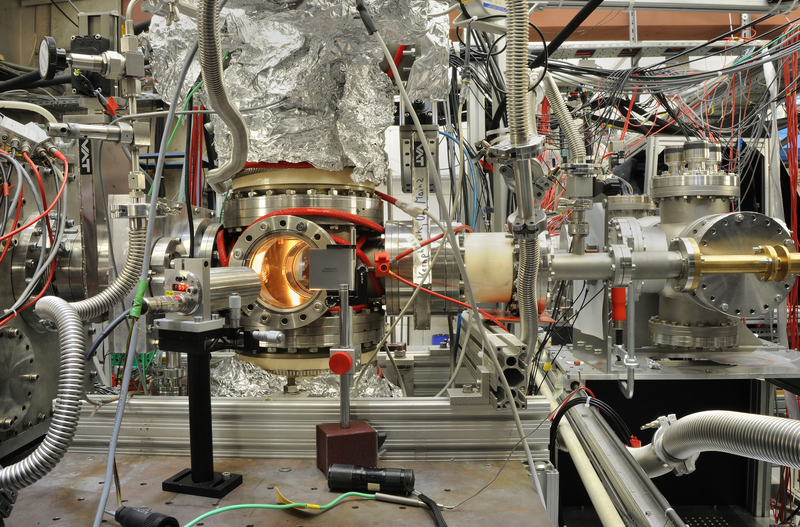 In the current experiments, nobelium isotopes were produced by fusion of calcium ions with lead at the velocity filter SHIP at GSI's accelerator facility. To enable laser spectroscopy, the high energetic nobelium atoms were stopped in argon gas. The results are based on a preceding experiment also conducted at GSI, exploring the atomic transitions of nobelium (No). The chemical element with atomic number 102 was discovered about 60 years ago. The recent experiment investigated the isotopes No-254, No-253, and No-252, which differ in the number of constituent neutrons in their nuclei, with laser spectroscopy. The rates available for the experiment reached values below one ion per second for the isotope No-252. From the measurements of the excitation frequency for the individual isotopes, the shift in color of the required laser light was determined for No-252 and No-254. For No-253, the fragmentation of the line into several hyperfine components induced by the single unpaired odd neutron was also resolved. The sizes and the shapes of the atomic nuclei were deduced from using theoretical calculations of the atomic structure of nobelium, which were carried out in collaboration with scientists from the Helmholtz Institute Jena in Germany, the University of Groningen in the Netherlands, and the University of New South Wales in Sydney, Australia. The results confirm that the nobelium isotopes are not spherical but are deformed like an American football. The measured change in size is consistent with nuclear model calculations performed by scientists from GSI and from the Michigan State University in the USA. These calculations predict that the studied nuclei feature a lower charge density in their center than at their surface. Thanks to these pioneering studies, further heavy nuclides will be accessible for laser spectroscopic techniques, enabling a systematic investigation of changes in size and shape in the region of heavy nuclei. These experiments are so far only possible at GSI and allow for a unique in-depth understanding of the atomic and nuclear structure of the heaviest elements. The results also play a role for the future facility FAIR (Facility for Antiproton and Ion Research), which is currently under construction at GSI. The same techniques and methods could also be employed in the low-energy branch of FAIR's super fragment separator. 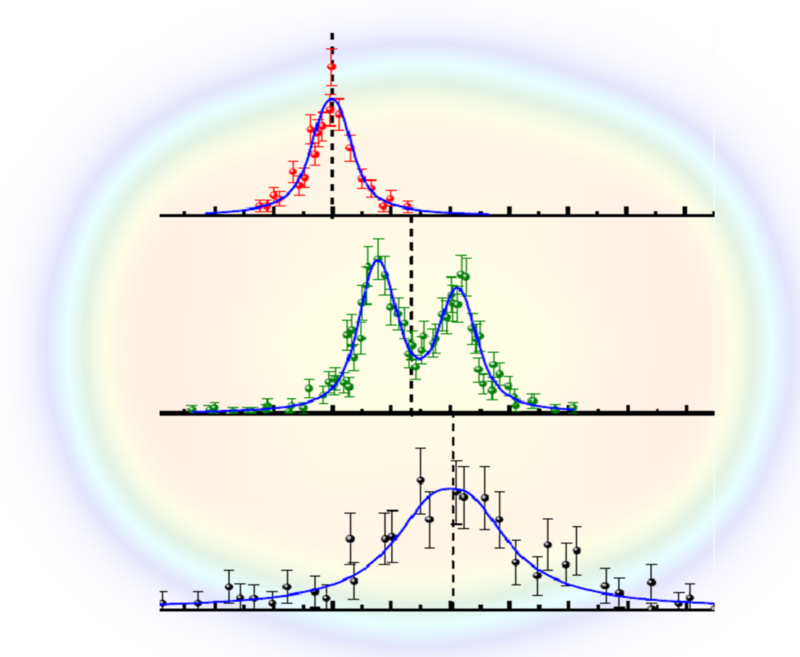 The experimental spectra from the laser spectroscopy of the three nobelium isotopes are shown in front of the calculated charge density distribution of No-254. Gas-filled optical cell for laser spectroscopy of nobelium isotopes: the cell is mounted behind the velocity filter SHIP (l.). The glowing filament is used to evaporate nobelium atoms for laser spectroscopy.